While universities bill themselves as pioneers of technology, they are behind the curve when it comes to its application to their core business. The use of virtual learning environments is now widespread, but there has been little engagement by the wider higher education community with the growing number of relevant applications of immersive technologies – which encompass augmented, mixed and virtual reality (AMVR). Perhaps as a result, there has been a distinct lack of strategic direction from most universities on the use of these innovations. To be fair, it takes time for any new technology to gain popularity, and working with AMVR requires users to acquire a certain level of proficiency in creating engaging content. But failure to engage with AMVR amounts to a wasted opportunity. The effectiveness and wide applicability of this technology in academia has been established in published studies. That message needs to be articulated more widely and compellingly to university leaders and academics. 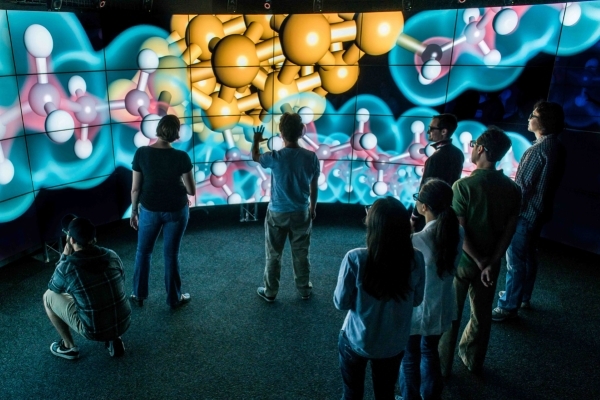 Immersive technologies are a very effective way both to communicate key concepts in teaching and to showcase research outputs – particularly to people from different disciplines. AMVR could be treated as an integral part of universities’ communication strategies to promote and celebrate their most innovative research and education efforts, with the direct involvement of the academics and students. As the use of social media in higher education is now commonplace, this could add a whole new interactive dimension to online public engagement. AMVR materials could also be used more widely as supplementary information to academic publications in traditional print media – for displaying content that cannot be shown in research monographs, textbooks or journals. Indeed, immersive content could become more than supplementary material if publishers would permit it – especially if guidelines could be agreed with academic communities and editorial boards on review criteria for mixed-media submissions. This would bring such content within the traditional academic reward system, encouraging its production. Higher education institutions should provide training to ensure that their academics and students understand the relevance of AMVR to their work and are equipped with basic skills to use and create immersive content. Having dedicated space for engaging with AMVR would help raise its institutional profile and facilitate the cross-fertilisation of disciplinary approaches to using it. External communication teams could also play an important role by working with the academics and students to create immersive materials as part of their strategy to engage with external stakeholders and alumni. Because AMVR is easily accessible with affordable consumer electronics, creating immersive experiences for the general public could increase universities’ impact. Given that AMVR is increasingly used in schools, it could also engage prospective students. But it is not just about public engagement. AMVR can help transform how research and education are integrated. In the framework of research-based education – learning through active participation in research and enquiry – students are encouraged to curate and showcase their academic outputs to internal and external audiences, including via online platforms. They could be supported to create immersive “showcase portfolios”, which they would submit as part of their university coursework. This would not only fit well into public engagement strategies but also help students create interdisciplinary links based on their academic work. For example, they could use augmented reality to create interactive commentaries on the significance of their work for scholars from other disciplines. They could also create content tailored towards engaging users with different academic backgrounds, on anything from research into historical photos or artefacts to engineering prototypes and macromolecules. Bringing students, academics, research and education closer together is a powerful way to shape higher education. By adopting this community approach, with institutional commitment, it would be possible to create a virtuous circle for democratising AMVR in academia that would yield rewards for students, academics, marketers and the general public. How long will it be before universities put their money where their mouths are and embrace the future? Vincent Tong and Sam Smidt are principal teaching fellows in the Arena Centre for Research-based Education and Matilda Katan is professor in the Division of Biosciences, all at UCL.